her hand in mine. our hands in His. Perhaps this part of the story begins on a Thursday night. The scene opens on me, alone at the computer, growing oh, just a tiny bit antsy for our baby to arrive. Five days beyond the “due date” and still I was feeling comfortably pregnant, experiencing no clue of any major status change in the near future. For the first time, I did a Google search on ways to naturally induce labor at home. The website I landed on suggested the usual: walking, visualizing birth, taking evening primrose oil capsules, drinking red raspberry leaf tea, etc. ; all things I was already practicing like a new religion. But the website also suggested talking to the baby, communicating that he is welcome to come into our lives. To describe his new home to him. To softly and kindly tell him there are people waiting to meet him, people who will love him very much (notice the use of the male pronoun here; I was convinced I carried a boy). So before bed that night, Ryan and I dedicated more time than normal talking to our little one, describing to him the world that awaited. Telling him about grandmas and grandpas and aunts, uncles and cousins that are thrilled that he would be coming soon. We told him how much we looked forward to holding him in our arms. We told him how much we love him. Ryan tried to read a poem in a ridiculous voice, but had me laughing too hard to finish. Then we all went to sleep. I woke at 6 a.m. after a full night of deep sleep, something I had rarely experienced these nine months. A new sensation woke me, something different than my normal Braxton Hicks contractions, something deeper, like mild menstrual cramps that ebbed and flowed. These came pretty consistently, about every fifteen minutes. I stayed calmer than calm, not convinced that this would lead anywhere interesting. Probably it was false labor. If not, then maybe I’d have a baby by the end of the day on Sunday. I didn’t even tell Ryan about the new sensations. He left to teach his morning class. I stayed home and cleaned the kitchen. But because the contractions were mildly painful and because they were consistent, I called our midwife. She told me to go about the day as usual, to finish preparing the house for the homebirth, and to be sure to nap in the afternoon because this just might be the night. Back home we clocked contractions, still 15 minutes apart. Together we started preparing for the homebirth: making the bed with old sheets, putting a loaf of bread in the bread-maker, setting up crock-pots and dishes in the dining room so the midwife and her assistants could eat the soups I’d made and froze weeks before. We called Justin and Alyssa, Ryan’s brother and sister-in-law, and told them it might be this weekend and to try clearing their calendar. The plan was for Alyssa to be a part of the birth and for Justin be our photographer after baby arrived. I took a shower. I curled my hair (vain, I know). Ryan made lunch, something simple and healthy, warm and good. Finally, we did what Peggy, my midwife, had told us we must do: we laid down and took a nap. We fell back asleep and around 2 p.m. a dear friend called to encourage me. She knew I wasn’t thrilled about going too far beyond my due date and wanted to stay connected and be a sounding board for my concerns. Ryan told her, too, that I was napping, as contractions weren’t really letting me jump up and run to the phone. After he got off the phone, I did get up and head toward the bathroom. I was surprised to find bloody show and surprised that contractions were getting to be seven to ten minutes apart. Ryan called Peggy and she came over around 3 p.m. She listened to the baby’s heart and checked me. I was already five centimeters dilated and mostly effaced. She told Ryan to set up the birth pool and to call her again if there were any changes. Peggy went home and I sat alone on the couch, breathing through contractions while focusing on a green “O” on the spine of a book on the bookshelf across the room. Then I did what every laboring knitter does: I started a knitting project. I had been told that knitting releases endorphins similar to those runners experience when they get a “runner’s high.” During pregnancy, I often thought I’d try knitting through labor as a way to release more of these beneficial hormones. Needless to say, I could only knit about five rounds of a mitten cuff before I grew too tired to carry on. I told Ryan that I needed to lay down again. My phenomenal husband was setting up the birth pool, putting another loaf of bread in the bread-maker, and timing my contractions all at once. I went to our bedroom, but after laying down contractions became more intense and I couldn’t stay immobile. I had to move. I had to sit. I had to bury my face in Ryan’s chest when confronting each wave. Around this time, there was more bloody show and contractions were timing in at three to five minutes apart. This was around 4:30 p.m. Ryan called the midwife’s assistant Mel, who was also my pregnancy and birthing mentor, to come coach me through the pains. He called Peggy around this time as well. 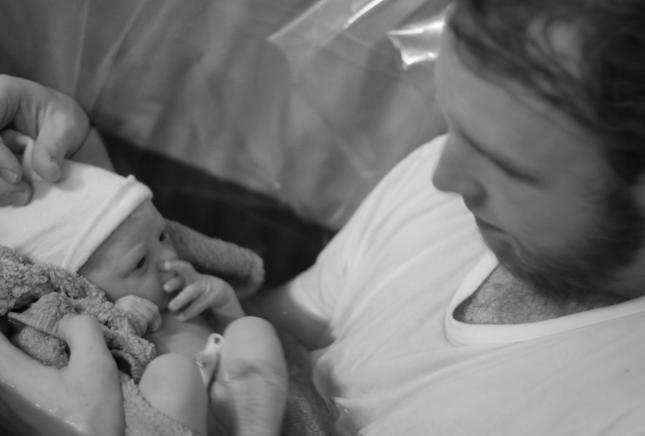 Both arrived at the house at 5 p.m., just as I was getting into the birth pool, which Ryan had set up in our kitchen. The warm water was only about five inches deep and already cooling, but in it I found relief. As we waited for the hot water tank to refill, Peggy and Mel were slowly filling the tub with steaming water from off the stove. 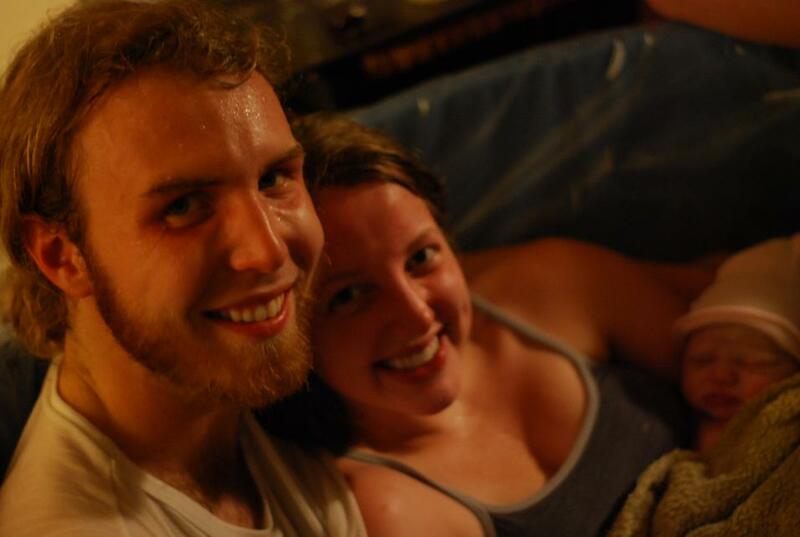 Ryan joined me in the birth pool and together we welcomed the contractions that would soon bring us our little one. I first labored with my back against Ryan’s chest, with his back against the wall of the pool. When the contractions intensified even more, I found that more of my body needed to be surrounded by warm water, so I laid down between his legs, my head supported on his chest. I am so grateful for warm water and buoyancy. Peggy suggested that I use gravity as a friend and rotate to all fours when it was clear to her that the time to push was near. I mustered up enough energy to make this move. My arms were then around my husband’s waist with my head resting in his chest for the remainder of labor, my legs between his legs with my feet pushing off of his feet as I pushed. He was literally my physical support through it all, not to mention my emotional and mental support. I still think he’s pretty awesome. Our baby crowned and began emerging flawlessly, underwater. All pronouns used by the birth team immediately changed from male to female when only the head was out. Peggy said afterward, “That face was just too cute to be a boy.” Our baby then fully arrived and, indeed, she was a girl. The time on the microwave read 7:26, making labor only three and a half hours long. Once she was introduced to air, our daughter cried out quickly and strongly then grew calm and quiet. She was handed directly to me, and together Ryan and I welcomed our new baby into this world. Her coloring was perfect. Her eyes were clear and bright. We locked gazes and exchanged soft words of blessing. She squeaked and squirmed and the three of us feel in love. The warm water surrounded her and eased the transition from womb to this new world. From the deep reaches of my heart, I was feeling an unexplainable mix of overwhelming shock, perfect joy and pure gratitude. Ryan and I held her, uninterrupted, for the longest time. 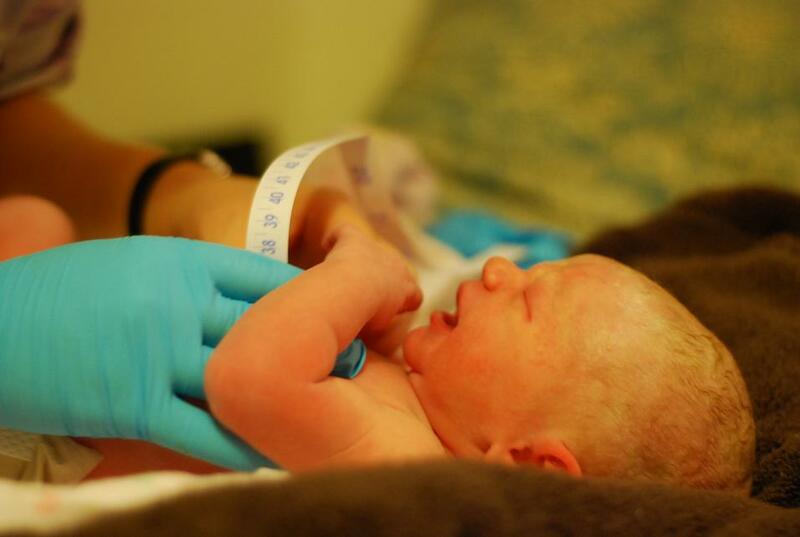 When her umbilical cord stopped pulsing, the new Aunt Alyssa cut her cord. Ryan and daughter spent time getting acquainted while I worked with Peggy and my body to birth the placenta. This last bit of labor was the farthest thing from my mind and I was slightly unmotivated to cooperate, but Peggy insisted. After this was accomplished, we were all ready to get out of the birth tub; I had never felt so soggy in my life. 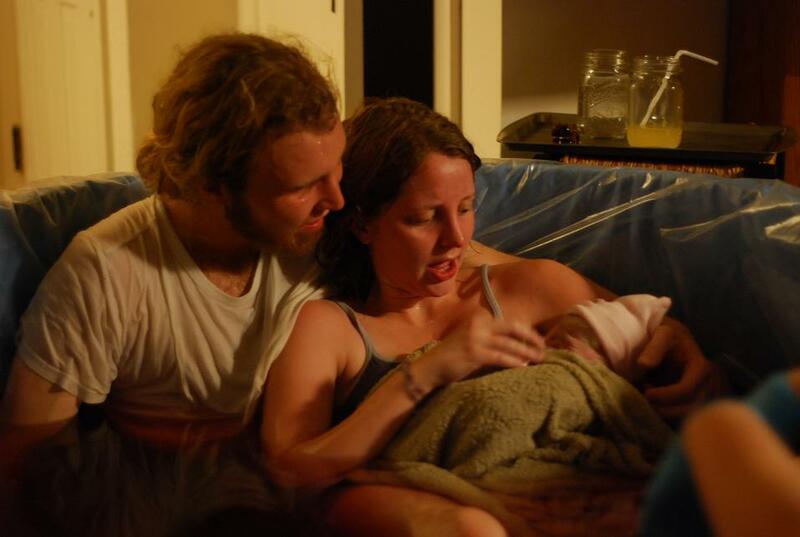 There are so many wonderful and beautiful aspects of a homebirth, but perhaps my favorite is the point when mom, dad and baby nestle together in the warm family bed and stay there as long as desired. 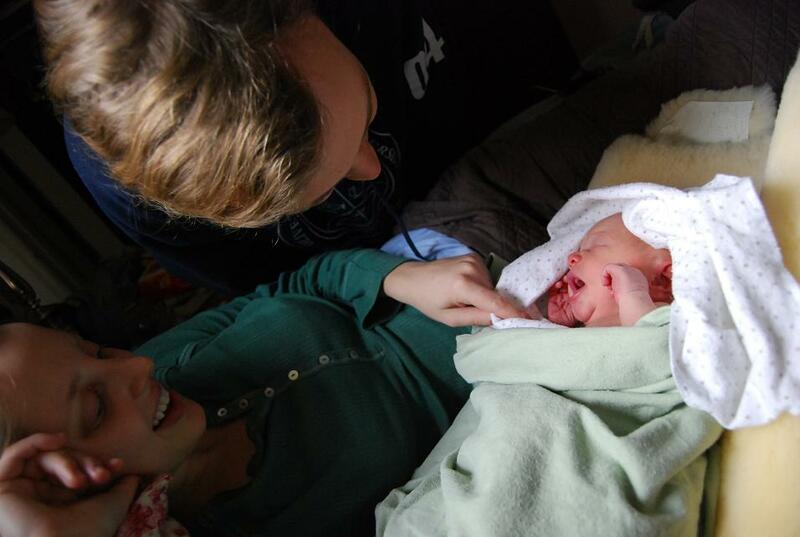 The three of us were given space and time alone to rest and marvel in the first hours of being a family. We called our families, all of whom hadn’t even known we were in labor. 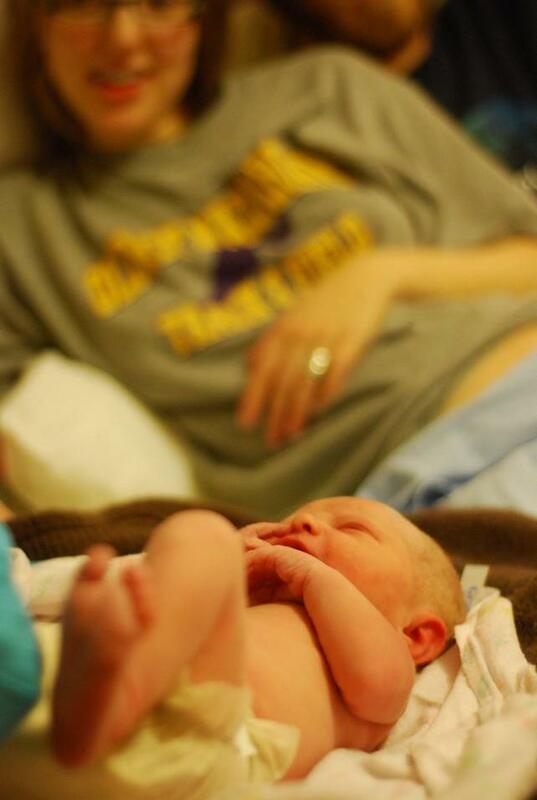 It took me a while to convince Grandma Blakemore that I’d actually had a baby just a few hours ago. I guess the phone calls were slightly vague as we hadn’t yet settled on a name or weighed or measured baby girl. 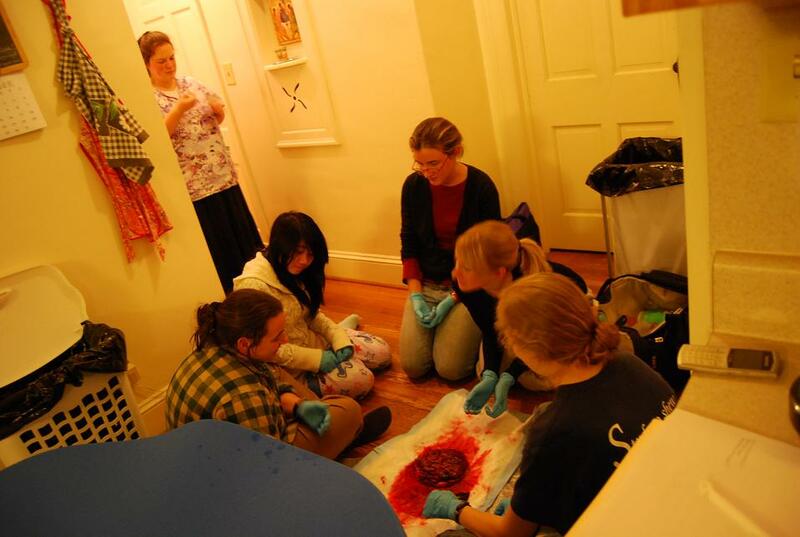 While we were sharing this time as a family, our housemates and Alyssa were being educated in all things placenta by birth assistants Mel and Hannah. The birth team and our friends used the rest of the evening to “clean up the kitchen.” What truly amazing people! Our daughter was examined right there in our bedroom. She weighed in at 6 lbs, 14 oz and measured 20 1/4 inches long. Peggy proceeded to put baby through the whole gambit of newborn tests, and wouldn’t you know it, the girl passed with flying colors. All of her reflexes were in order, her vital signs strong; ten fingers and ten toes. Before leaving, Peggy and Mel helped us establish breastfeeding, Peggy promising to return in two days to check in on us. Just as calmly and peacefully as they arrived, the birth team departed leaving a house full of very happy (and quite sleepy) people. 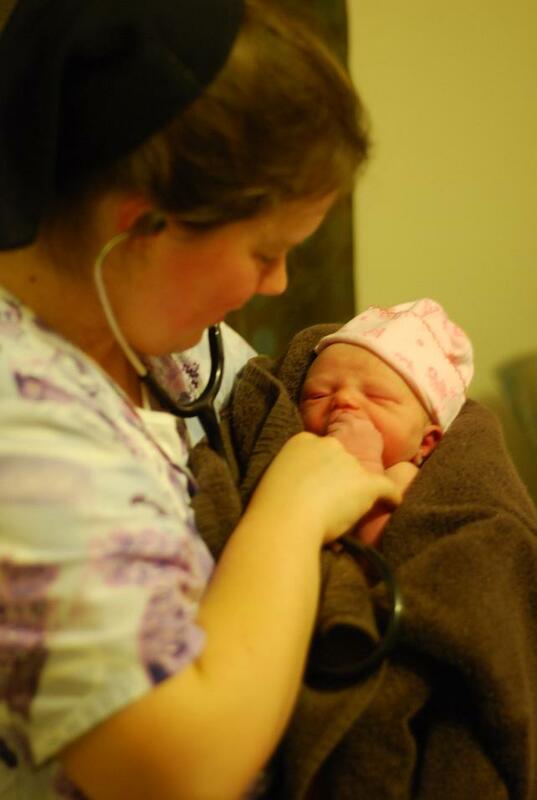 our wonderful midwife, Peggy. and baby. infant exam with us looking on. To see a new life begin in such a beautiful, gentle, peaceful, safe, and simple way changed my world. 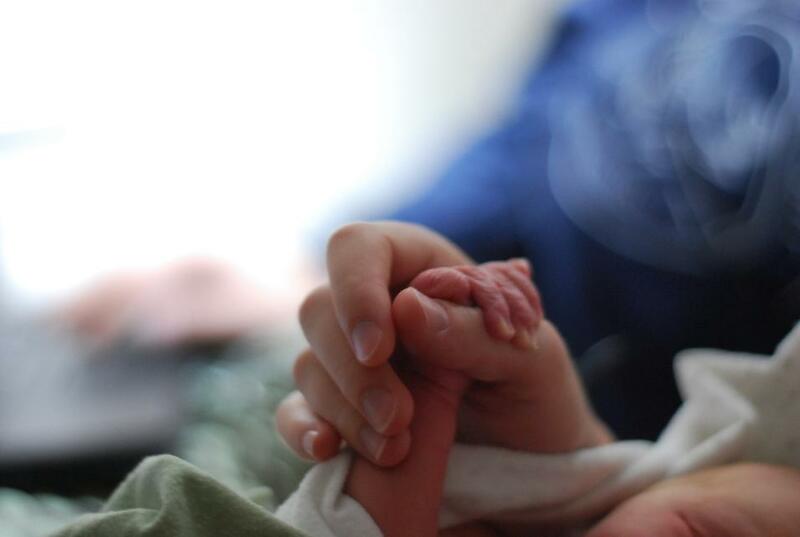 To share this new life and the experience of bringing it into being with friends, family, and immensely capable and endlessly compassionate birth assistants, in our own home, is a mercy that was extended to us that we never would have imagined could have been ours. It was a journey of grace. While I know that there are reasons why some women might not be able to experience a homebirth, it is now my earnest prayer that all women at least know and give honest consideration to this intensely wholesome and miraculous opportunity. The next morning, more than fifteen hours after she was born, Ryan and I named our new daughter Juniper Bronte Beuthin. This was so beautiful it made me cry on the bus. Congratulations to all 3 of you. -An old friend, Angie H.
Wowee wow Janie. Thank you for sharing. BEAUTIFUL. Simply beautiful. God has answered all our prayers and more. Fabulous! You have clearly approached this with prayer and serious counsel, and that is clearly communicated in this excellent story. I’m so proud of you. Much love. This is absolutely the most beautiful story I have EVER read and the most amazing part about it is that it’s TRUE! And it happened to MY daughter! My mixed emotions of joy and relief are overwhelming and I CANNOT wait to meet Juniper. What a truly amazing story. I didn’t know child birth could be so beautiful. I can’t wait to see you all. Much love always. Beautiful baby girl and beautiful family! She is a lucky little soul to have you two as parents! Janie, you are such a wonderful writer, thank you for sharing yours and Ryan’s sweet, sweet story. I have two friends who are pregnant and I will send them the link to your website. Okay, I admit it. I made one of those phone calls! Oi vey! So sorry. I explained why I was calling in an e-mail to Ryan. But I don’t mind being cursed from a birthing pool. 🙂 Here’s hoping those rings sounded like Heaven’s bells to Juniper ! I know you don’t know me but our mutual friend, Carey Dunlop, guided me to your site. I cried! What a beautiful story! I was unable to do this with my first as she came very unexpectedly and early but I hope to be able to experience this with future children. Thank you for your story!